Visit Claude Monet’s house : Given by his son Michel to the French Academy of Fine Arts in 1966, the rough-cast pink house was where the doyen of the french impressionists school lived between 1883 and 1926. The house has been restored as it was before with its original interior colours and charm. You can see the Master of Giverny’s own precious collection of Japanese prints hung just as they were by him. Outside is Monet’s large studio where he painted the famous Waterlily series. The studio now houses the Claude Monet Foundation shop. 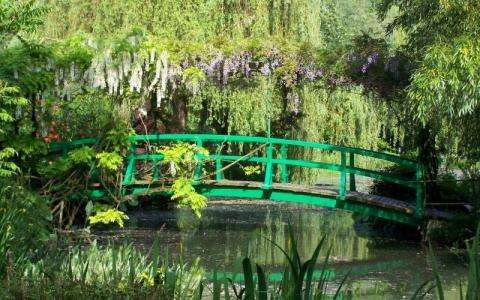 The gardens were restored to their original state and visitors can admire this « painting set within nature » which Claude Monet’s contemporaries considered to be among his greatest masterpieces. In front of the house and studios, the « Clos Normand » garden extends in straight lines with vaults of aerial plants surrounding dazzling flowerbeds. From spring to autumn, the gardens reflect the changing palette of the painter-gardener « mad about flowers. » Further down and created by a diversion in the river Epte lays the water garden in the shade of willow trees with its famous Japanese bridge. The gardens burst with wisteria, azaleas and of course there is the famous water lily pond too. A panoply of water and sky is what gave birth to the pictorial universe of the Waterlily paintings. Included : * Transportation in luxury air conditioned coach * Entrance to Giverny (gardens and house) * The services of a licensed multilingual Cityrama guide From April 1, 2013 Summer : Adults 77€ / Child : 46€ Everyday except Sunday Departure : 13h45 Sundays Departure: 8h15 For reservation please contact directly the Grand Hotel Leveque.